Cassandra Cain is my favorite Batgirl. I love Barbara Gordon, but honestly, I think she’s better as Oracle. And don’t diss Stephanie Brown in front of me, because she’s awesome, and I’ll probably write a review of her time as Batgirl at some point. (ETA: It’s written.) But in my humble opinion, Cass will always be the best. 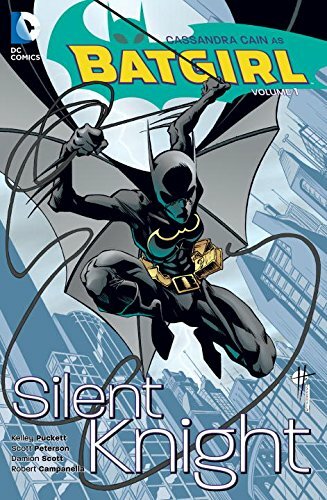 What’s so great about Cassandra Cain? Heck, where do I start? She was first introduced in the Batman: No Man’s Land story-arc. The basic premise was that after a major earthquake, the government evacuated Gotham City, cutting off those who chose to stay from the outside world and any kind of help. Yeah. Take Gotham, which is a crime-infested hellhole on the best of days, and turn up the danger to post-apocalyptic extremes. It’s that bad. Enter the precious cinnamon bun that is Cassandra Cain: a mute, homeless girl who saves Commissioner Gordon’s life. She becomes Batgirl with the blessings of both Batman and Oracle (AKA the original Batgirl), but there’s more to her than meets the eye. You see, Cass is the daughter of a notorious assassin. Her father raised her without ever exposing her to spoken language. Instead, she learned to read body language. She can take one look at someone and know what they’re feeling—and exactly how they’re planning to attack. On top of her skills in hand-to-hand combat, being able to anticipate her opponent’s next move makes her one of the best fighters in the DC universe. So that’s the dichotomy of Cassandra Cain. She was raised to be a deadly assassin and can fight Batman to a standstill, but at the same time, her upbringing was so isolated that there’s a strange innocence about her. Early on in her solo title, a psychic rearranges her brain so that she can process spoken language (which accidentally handicaps her combat skills for a while), but it isn’t an insta-fix. A lot of her character arc involves learning different words and how to read and write. Even once she can speak, she struggles to find the right words, and her sentences are halting and awkward. That’s something you don’t see a lot in comics—or any media, really. The best reason Cass is my favorite Batgirl is that she brings something unique to the Bat-family. Her mentor/mentee relationship with Barbara is nuanced and lovely. She has Batman’s respect and a nice dynamic with Robin (Tim Drake). Nightwing is the big brother figure, and she’s besties with Steph, and—well, there’s a lot to like here. If you’re a fan of characters choosing their own families, you’ll enjoy Cass’s book, because her real parents are total jerks. And that’s Cass Cain in a nutshell (before the awful character assassination that happened later, but I won’t get into that). No Man’s Land is worth a read, but I’d recommend starting with her solo title. It’s a great introduction to the character and was the first Batgirl comic I ever read. Are you a fan of Cass? Babs? Steph? I’ll fight you over who’s the best Batgirl in the comments!